From local fynbos to forest trees and Namaqualand succulents! We grow beautiful, hardy plants and trees specifically designed by nature to flourish in local climate conditions which we supply wholesale or grow to order. 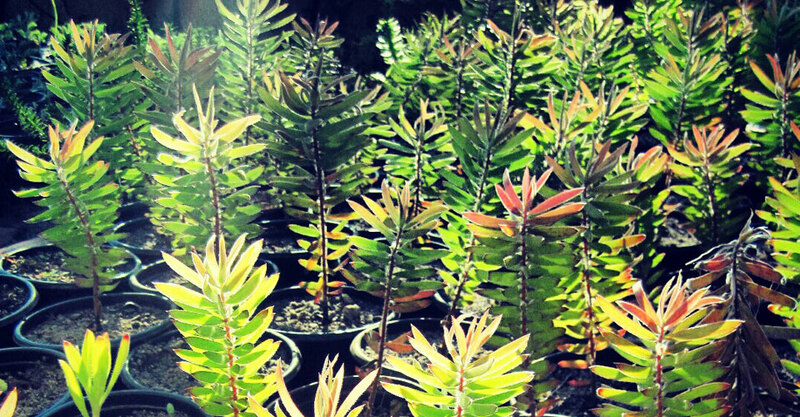 We can assist with plant rehabilitation, plant identification and guide you on using fynbos and indigenous plants in gardens. We specialise in landscaping and garden design using only indigenous plants and trees, creating beautiful landscapes that are environmentally friendly too. Visit Good Hope Gardens Landscaping for more. We run courses for adults and children to learn about fynbos and edible and medicinal plants. Spend an enjoyable day foraging near Cape Point and then learn how to prepare and eat what you find. Visit our blog for up to date news & information. Good Hope Gardens nursery stocks a comprehensive range of indigenous plants and trees which we supply wholesale and can grow for contracts. Come join in the fun at the Good Hope Gardens Nursery in the Veld and Sea classroom. We offer an array of different foraging courses depending on the season and what’s available but the standard process is, you’ll learn about loads of edible indigenous plants, you’ll go out, find them in nature and pick them, and then you’ll create a delicious feast and eat them. – Franchesca Watson, House and Garden. – Rupert Jefferies, Cape Chat. – Marianne Alexander, Country Life.